Telluride Regional Airport is one of the highest airports in the country and flying into and out of it is a unique treat. The setting, with breathtaking 360-degree views, is unparalleled as is the convenience of being within a six-mile drive from Telluride and Mountain Village. Several charter companies offer private and convenient flights, as well as fractional ownership opportunities. Charters into Telluride include Mountain Aviation, Incredijet, NetJets, Fresh Air, Marquis Jet and Telluride Air Taxi. 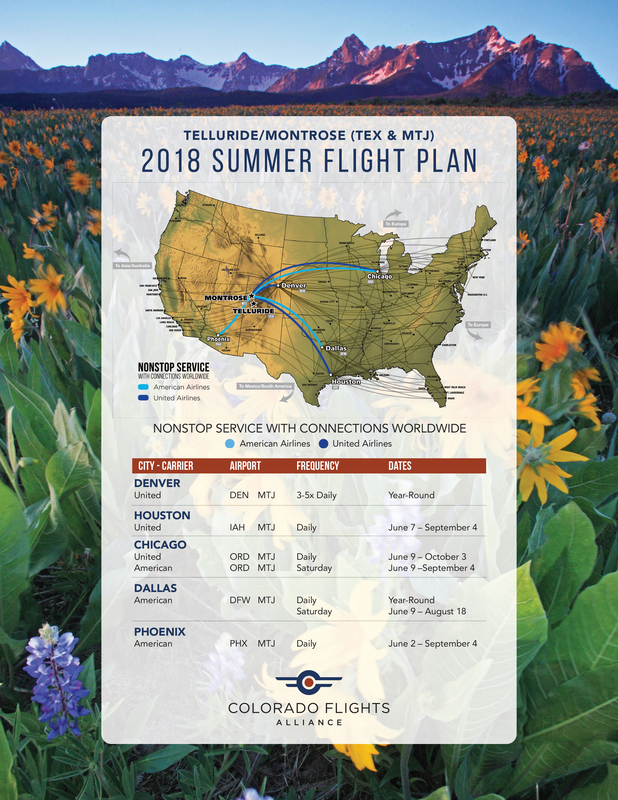 Montrose Regional Airport is 60 miles from Telluride and boasts flights with airlines such as American Airlines, United, Delta and Allegiant Air. Nonstop service to and from Denver, Chicago, Newark, Dallas, Houston, Atlanta, Phoenix and Los Angeles. Regional Airports also include Cortez, Durango and Grand Junction.